Not quite poems. Not quite essays. C.D. Wright's final collection before her untimely death earlier this year is a fitting farewell for -- and arguably even introduction to -- a poet who defied formal identification. 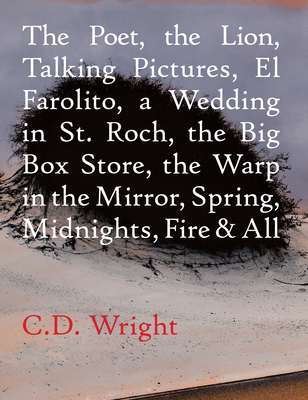 In the course of saluting the likes of Robert Creeley, Jean Valentine, and William Carlos Williams, and meanderingly reflecting on her time spent in Mexico and with those who have lost lifetimes in prison, Wright gives us a master-class in modern American poetry. Fans of Mary Ruefle's underground classic, Madness, Rack, and Honey, should take special note. C.D. Wright: C.D. Wright has published over a dozen works of poetry and prose, including the recent volumes One With Others, which was nominated for a National Book Award, One Big Self: An Investigation, and Rising Falling Hovering. Among her many honors are the Robert Creeley Award, the Griffin Poetry Prize, and a MacArthur Fellowship. She teaches at Brown University and lives outside of Providence, Rhode Island.